As with any website host, reliability is the absolute first thing that needs to be discussed before moving on to the features that the host provides. Fortunately, HostClear passes this test with flying colors as they host their services from a state-of-the-art data center that is among the best in the business. They also take the extra steps with their reliability by ensuring that each website is completely secure and run daily backups to protect loss of data in emergency situations. When first starting out, you have the option of choosing between either cPanel or their very own website builder. cPanel is a popular control panel choice among experienced website users as it allows you to basically cater your site to meet your unique needs. Users that are not as experienced, however, will enjoy the drag and drop website builder that they offer. While the website builder does not feature as many options as you would have with cPanel, it does provide just enough to get you started. One of the cons of having to make this choice is that you are unable to switch from cPanel to website builder or vice versa after your initial decision is made. It would definitely be a good idea to speak with a member of their customer support team to determine which is best for your unique situation. As with reliability, top notch customer support is absolutely essential to compete in today’s ultra-competitive hosting industry. HostClear once again passes this test as they provide 24/7 support through email, live chat, or by phone. The live chat is actually very convenient as you usually only have to wait 4-5 minutes before speaking with one of their representatives. On top of the around the clock support, they also have a knowledge base that allows you to search for answers to questions based on what your current needs are. To top it off further, their answers to questions are quite comprehensive and most provide step-by-step solutions or tutorials. HostClear offers the advantage of both a free domain name and allowing you to create an unlimited amount of email addresses for your website. Premium domain names, however, will require some extra cash on your part. With the unlimited email addresses, you also receive unlimited disk space and bandwidth. They do point out that there are some limitations as far as what each email address can handle so you may want to chat with a customer service representative to get more information as to their specific terms. The only real con associated with choosing HostClear as a host is that it is generally considered to be a platform for beginner users. While the ability to choose cPanel does give advanced users some choices, experienced users may prefer to go with something that has a bit more versatility to it. Just realize, however, that you probably will not find anything more advanced than what HostClear offers at a similar price. The overall value that they provide is going to be very difficult to beat. The pricing of HostClear is similar to what you will find with many other hosts that are catered to the beginner website user. While they advertise $2.99/month on their site, you should be aware that this is only for the first month of use (unless you agree to a 3-year term). Even still, if you make the decision to go with their monthly plan you will only be paying $6.99/month. Agreeing to a 1-year term puts you at $4.99/month while going with the 2-year plan is $3.99/month. They also provide significant discounts for paying in advance. It should also be understood that there are several add-ons that you can choose to purchase with your plan. Most of these have to do with SEO related stuff and other things that allow you to promote your website. Overall, it seems as if HostClear is a great option for beginners that have little to no experience using a web hosting service. Their easy to use interface and around the clock customer support make them a solid option for someone starting out, although they do lack a lot of the advanced features that experienced users would usually prefer to see. One of the other main advantages of trying HostClear out is the fact that they offer a money back guarantee for users that are unsatisfied with their services. With that type of confidence, you really have nothing to lose by giving them a shot. At the end of the day, HostClear can be defined as an above average host that provides a reliable, easy-to-use service to beginner users that are inexperienced in using web hosting services. 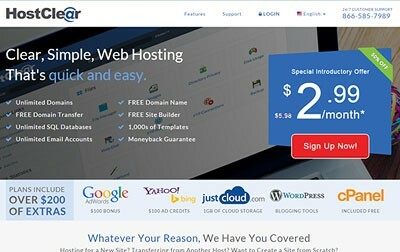 Great website builder, satisfactory customer support, free domain name and unlimited email addresses. Starts at $2.99/month. Still on hold……..60 minutes……and still waiting…. + PROS: Awesome Hosting, Love it all. - CONS: Zero Customer Service NO support at all I have been on hold WAITING for someone to answer the call.... 62 minutes and STILL waiting.